How to Plan a Trip to Chail – Himachal Pradesh? When you talk or read about places fit for a quick weekend getaway from cities like Delhi or Chandigarh; a name that you will come across often is of Chail. This tiny yet beautiful hamlet happens to be located close to Shimla, one of the most visited tourist destination of our country. It is also just a few hours of journey from both Delhi and Chandigarh. Yet Chail somehow manages and continues to remain hidden from the tourist crowd that swarms Shimla each year. Only a handful of people visit here which makes Chail a perfect place for someone who wants to visit an offbeat destination and spend some time away from the crowd. In this article, I will provide some details on how you can plan a visit to Chail; why should you visit Chail and what can you see here. For a brief introduction, Chail is a small hill station in Himachal Pradesh, located about 44 kilometers from Shimla and 45 kilometers from Solan. A road bifurcates near Kandaghat from Chandigarh Shimla highway; and from here Chail is about 50 kilometers and an hour’s drive away. Other routes consist of roads from Kufri and Solan which I will talk about further in this article. Often known as a “hiker’s paradise”, Chail is an idyllic retreat with its pine covered hills, lush meadows, tranquility, landscapes and magnificent views of the majestic Himalayas. There is really not much to do here except for to enjoy the serenity of the place; but that is exactly what you should visit Chail for. 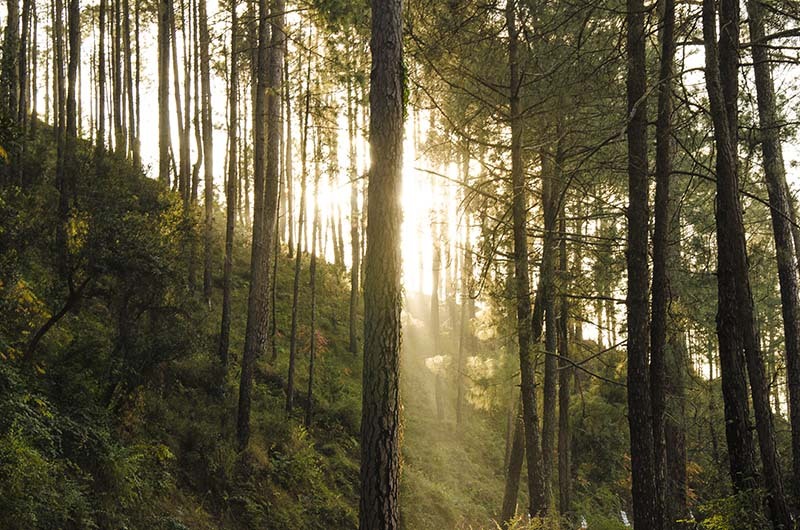 You will totally love Chail for its greenery, peace, and pleasant weather. Chail also has quite a bit of an interesting history to it. Back in 1891, Maharaja Bhupinder Singh of Patiala ended up in a row with Lord Kitchener of East India company over some political issue. This infuriated Lord Kitchener so much that he banned Maharaja’s entry in Shimla which at that time was the summer capital of ruling English. Insulted by this move, the Maharaja vowed to build his own summer capital and hence Chail came into existence. First the Royal Palace was built here and then slowly the village grew around it. For a long time, Chail remained as the summer capital of Patiala Kings; but after accession to the Indian Union, Maharaja of Patiala donated most of his buildings to Chail Military School and Government of India. His royal palace here however was turned into a heritage hotel and still remains so. So the first question that comes to mind is why to visit Chail and not head elsewhere? If you are someone who enjoys a bit of shopping; some time in busy markets; eating at fancy restaurants etc; then Chail is not the place for you. If you are however someone who wants a quiet holiday away from the hustle-bustle of other more popular and crowded hill stations; then Chail is where you should be going. It becomes an even better destination for people who either do not have too many days in hand; or don’t want to spend long hours traveling. Chail is one of those places that feels extremely beautiful and delicate; the kind that you go to for just sitting and enjoying a cup of tea while looking at lush valleys with clouds floating over. It is the natural beauty at its best; and it is the peace and tranquility that you should be visiting Chail for. Due to its location up in the hills, the only way to reach Chail is by road. You can either drive all the way from home; or you can first take a train or flight to as close as you can and then get to Chail. Regular buses are available so a trip by public transport too is an option. The nearest airport to Chail is the Jubbarhatti airport in Shimla at a distance of 62 kilometers. The nearest major airport however is at Chandigarh which is 117 kilometers away. From both Shimla and Chandigarh, you can either look for a taxi or board a bus for the final lap of your journey to Chail. Chandigarh is very well connected by flight to rest of the country so you will have no problem booking a flight to here. The nearest narrow gauge railway station to Chail is at Kandaghat. The Kalka – Shimla toy train passes through Kandaghat where you can get down and find an alternate mode of transport to reach Chail by road. Or you can ride the train all the way to Shimla and then find a bus from Shimla to Chail. To reach Chail by train, you will first have to either book a train for Kalka or Chandigarh. If you were coming from Delhi for example, you can board the Howrah – Delhi – Kalka mail and reach Kalka. The Toy train from Kalka leaves at 4 AM, 6 AM and 12:10 PM. You can board either of these three and then ride it till Kandaghat or Shimla. From Kalka, the train takes about 2.5 hours to reach Kandaghat. Though you can find taxis at Kandaghat for Chail, it would be better to reach Shimla first by train due to availability of better transport facilities at Shimla. The journey to Chail from Shimla passes through a scenic route. Kufri, another major tourist destination in the region, is also en route Chail from Shimla. If there was no direct train to Kalka from your city, then you can book a seat in any train to Chandigarh and then reach Chail from there by road. You can easily find a taxi for Chail from Chandigarh airport or board a bus from there for Shimla and then reach Chail. Now there are three major routes that you can take to arrive at Chail by road. The most common one is via Kandaghat if you were coming from Delhi or Chandigarh. Second is via Kufri from Shimla. A third route exists from Solan. There are of course several other roads as well but these are mostly used by the locals. For tourist movement, reaching Chail either via Shimla or Kandaghat is recommended. The best way to reach Chail by Bus is via Shimla. Being a well-known tourist destination, regular buses ply to Shimla from almost every major city nearby. Once you arrive at Shimla, you will easily be able to find a bus or shared taxi going towards Chail. You can also opt to get down at Kandaghat but the frequency of public transport on Kandaghat – Chail route is not that great due to which, it is recommended to first arrive at Shimla. Chail is situated at an altitude of 2,250 meters due to which, the climate here mostly remains cold throughout the year. Overall, Chail is pleasant in summers and very cold in winter. From April to June, the temperature in Chail fluctuates between 15 and 30 degrees Celsius; depending on the time of the day. Days remain pleasantly warm and you can take a stroll just wearing your regular cottons. At nights however, it will definitely get colder and you will need a jacket or woolens to cover yourself. The speed of wind increases and you would be able to feel the chill the moment sun goes down. Monsoon arrives in the month of July and remains till late August or early September. Temperature at this time may drop a bit owing to the rain but remains between 20 to 30 at an average. Average annual rainfall is about 150 mm. If it rained too much then it may result in landslides in the region; sometimes so bad that even the roads may get temporarily blocked. Winter starts to settle in here in October after which, the temperature continues to dip. Average winter temperature in Chail fluctuates between -5 to 5 degrees Celsius and it can snow here any time after December. The months from April to June and then September to October are mostly considered as the best time to visit Chail. Weather remains pleasant from April to June; neither too cold nor too warm. But the greenery at this time remains missing and some people may find the mountains around to be a bit dry and barren. July and August is not said to be a good time to visit because of the heavy rainfall and resulting landslides; but then this is truly the time when the vistas around are at their best. September is by far my favorite time to visit Chail. In this month, Monsoon is long gone but the greenery is still there. The lush green hills and valleys are a feast for the eyes and weather has not yet gotten too cold. For someone who wants to visit here to see some snow, a trip in the months of January or February will be best. This will also depend on which month you are traveling in; but for most of the year, your regular summer clothes along with a jacket will suffice. Between April and October, bring plenty of cottons, a couple of jackets and that is all you will need. It won’t get too cold during day and you won’t feel a need to put on woolens or a jacket. It will be a bit cold around early morning and evenings for which you would have to put on a jacket for a little while. If you are visiting Chail during monsoon; months of July and August that is; then it would be better to pack clothes that won’t take too long to dry; polyester for example. In terms of shoes, your regular sports shoes will do but for monsoon, you may want to pack a pair of rubber sandals as well; like crocs for example. If you were however visiting here in winter, then you would have to bring all woolens and a good windproof jacket. It is better if your jacket had a hood to protect your neck, head, ears and face. If it doesn’t, then you would also have to pack a cap and muffler. Gloves and warm socks too are a must during winters. The natural beauty of Chail would remain to be its primary attraction. The place is surrounded by the forests of chir pine and gigantic deodars. 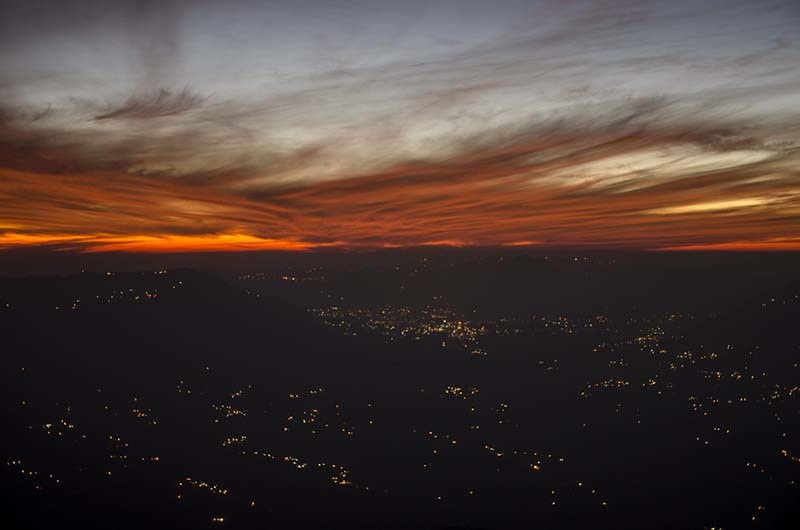 At nights, you get a clear view of Shimla, Solan and Kasauli which can be some great night shots for anyone interested in photography. Apart from the natural beauty, there are however some places that can be termed must visit for any tourist. Below is a list of such tourist places in Chail. This is my favorite place in all of Chail. The view of the sunset here will simply blow your mind away. I can guarantee that you would have never seen a sunset like this ever before in your life. Kali ka Tibba is situated at the top of a hill and there is a Kali Mata temple built at the top; hence the name “Kaali ka Tibba”. It attracts a lot of pilgrims and tourists from all across the world. From the top you also get a breathtaking view of Choor Chandni and Shivalik Range. Formerly the hunting ground of Maharaja of Patiala, the sanctuary was notified on 21 March 1976; and covers an area of about 10,854.36 hectares. Chail Wildlife Sanctuary is one of the lesser-known but most well-maintained wildlife sanctuaries in the country. It houses a rich collection of flora and fauna; and wildlife including ghoral, kakkar, sambhar, red jungle fowl, khalij phesant, cheer pheasant, wild boar, European red deer, spotted deer, common Langur, flying squirrel, Himalayan black bear, Golden Eagle grey-headed flycatcher. The Chail sanctuary has “Machan” like sighting posts built at Khuruin. Sadhupul is a small town in Himachal Pradesh between Chail and Solan. It is best known for its river restaurants and camp sites. A small bridge constructed over the river “Ashwini” had the place named as Sadhupul. Situated at a height of 2,244 meters, it is considered as world’s highest cricket ground. It was built in 1893. In one corner of the ground there is a historic tree on which the Military School has constructed a tree house. There have been talks to develop this ground further and host international cricket matches here. Gurudwara at Chail was the first building to be constructed here by the Maharaja of Patiala. It was only after the completion of Gurudwara that Maharaja started building his own palace. It is built in Indo-Western style, with its 22 feet high wooden roof being its main attraction. It is located barely half a kilometer away from main bazaar and offers the facility of a free overnight stay at the dormitory and few small rooms. The Langar Hall of course arranges for food to be provided to people free of cost. It is actually a scenic spot inside the Maharaja Palace. Apart from visiting all the other places I listed above, there really isn’t much to do in Chail except for relaxing and enjoying the peace around you. Some other activities that you can however indulge yourself in are as mentioned below. These however will completely depend on your own personal preference and hobbies. If photography is an interest of your then there is plenty to capture in Chail. Try getting some sunset shots from Kali ka Tibba and I bet that you will love them. Chail wildlife sanctuary has a myriad species of birds and animals that you would love clicking. If you have interest in wildlife or have children accompanying you on the trip; then apart from visiting Chail wildlife sanctuary, you can also extend the wildlife tour by planning a visit to nearby Himalayan Nature Park at Kufri. This is another activity that you can indulge yourself in. There is one small trek that I have done from Sadhupul to Chail but it could be a day long activity. A few other trails include towards Shimla and Kufri. There are a few hotels in Chail, both luxury and budget that you could stay at. Hotel Chail Palace of course would be at treat if it fitted in your budget. There is another one called Hotel Deventure where I have stayed and can tell you that it is good. If you are a bit on the budget side though, then just reach the man market of Chail; walk around a bit and you will find several budget hotels there. Whether or not to book in advance is completely your personal choice. I have never booked my stay and was always easily able to find accommodation in Chail. In fact, this way I was also able to negotiate the price down a bit. If however, you would like to book a hotel for your own peace of mind, you could do that as well. There are a couple of banks and ATMs near the main market in Chail. SBI and UCO Bank I know have branches here. Their ATMs too I have always found to be functional and cash available. There is a petrol pump in Chail just before you enter the market area. It is actually located right next to Hotel Deventure. However, the last time I visited Chail, this petrol pump was not functional. You will however find several other gas stations en route; near Shimla, Solan and on Chandigarh – Kandaghat route. In terms of mechanics as well, there are a few avialable in Chail and along the route for minor fixes. In case of a major breakdown however, you will have to look for a mechanic in Shimla. There is a chemist shop and doctor available here for small ailments. For anything serious however, you will have to rush to nearby Shimla city. All major cellular companies have coverage in Chail. No matter which network you were on, your phone will work fine in Chail. The best part I like about visiting Chail is that this trip can be easily planned over a weekend or 3 days. No it doesn’t mean that you cannot spend more days here. There is plenty to see at Chail itself and places nearby; so you can definitely make it a trip for a longer duration. By including some other places like Shimla and Kufri, your journey can last for a good 4 to 5 days as well. I have known some people who were headed towards Kinnaur and Spiti valleys and included a night stay at Chail in their plan. Your final travel plan will of course depend on how many days you have and how you are traveling; but as an example, I will suggest a few travel plans that you can follow. For the sake of this article, I will assume that you are traveling from Delhi. This will be a very simple plan. You start from Delhi, arrive at Chail, stay there for a day and go back home on 3rd. While coming from Delhi to Chail, take the route via Kandaghat and Sadhupul. This will take you about 7 hours in total. Stay in Chail 2 and spend time visiting places I listed above. On Day 3 however, while going back home, I will recommend that instead of going back the same way; you should first drive to Kufri. If interested, you can even visit the national wildlife park here. From Kufri then, drive down to Shimla and continue further to Delhi. If you were however visiting over a weekend and only had 2 days in hand, the you will have to take out Day 2. You will reach Chail via Sadhupul on Day 1. Start early from Delhi, possibly by 4 AM so that you can reach Chail by 12 noon easily. Check into a hotel, see the places I listed above and reach Kali ka Tibba by evening. Enjoy a magnificent sunset view from the Tibba and arrive back at hotel. On Day 2, drive back to Delhi via Kufri and Shimla. Depending on how early you started from Chail, you can also spend some time at mall road in Shimla. If you however had a few more days in hand, then the itinerary can be as mentioned below. Road conditions in and around Chail are mostly all good. There is some road widening work going on between Chandigarh and Shimla which can result in slow traffic. Kandaghat to Chail road Condition: The Kandaghat to Chail road however has some really bad stretches. Between Kandaghat and Sadhupul, the road is a bit steep and bad. It will remain bad as you climb up from Sadhupul to Chail but then improves as you get closer to Chail. Shimla to Chail Road Condition: Between Shimla and Chail via Kufri, the road is a mix of good and average but the climb is narrow and very steep at several places. Shimla to Narkanda Road Condition: From Shimla to Narkanda, if you were following the last 2 itineraries, is a completely smooth run of 2 hours at most. Solan to Chail road condition: Road from Solan too is mostly a mix of good and average. There are a few sections of broken road but work to correct it was under progress the last time I traveled here. Chail is located at an altitude of 2,250 meters (7,380 ft) above sea level. To be very honest, there aren’t too many shopping options in Chail. The town has a very small market that the locals use to buy groceries from. Locally made woolen shawls, handicrafts, carpets and Himachali caps however can be bought in Chail. If you were looking forward to some shopping then a better choice would be to go to Shimla and visit the market there. Like shopping, there is really no dish that could be called a specialty of Chail or this region as a matter of fact. Most of the north Indian dishes however are available in the restaurants here. Depending on your own preference, you can either chose to eat at the hotel you were staying at. Or you can just walk down to the market and eat at any of the dhabas / restaurants. For budget travelers, I will recommend that you eat at the market. The food here won’t cost you much. A winter trip to Chail means cold weather and temperatures close to 0 degrees Celsius; if not below it. It can snow in Chail anytime from end of December till mid of February. A snowfall in November or March will be a very rare occurrence but it will still be very cold. You will need to bring all your warm woolens, gloves, warm socks and windproof jacket for a winter trip to Chail. Road connectivity however remains open throughout the year, even in winter. The only road that can sometimes get closed is from Shimla to Chail via Kufri. This stretch can get completely buried under snow due to heavy snowfall in January. The one via Kandaghat or Solan however remain open for all 12 months. Hotels too remain open in winter season as well so you will have no problem finding a place to stay. I hope the information above on planning a trip to Chail was of help. If you have any other questions; or need any further details; please feel free to ask in the comments section below; or at our Community Forum; and I will be glad to answer. Thanks a lot man! I was wondering how are the bus frequencies from Chail to either Shimla or Kufri? *I could not find it in the article above, sorry if it’s there and I missed it! Hi Mohak – As far as I know, there are just 2 buses between Shimla and Chail daily. But the local taxis continue to travel all day long so if you were not able to find a Bus, go for a shared cab. You will get these from Chail Bus stand itself. Dear khan sabh, it’s really a very interesting information that you shared about chail. It’s really very informative and attractive. Dear Satish Bhai – Thank you so much for taking the time to drop a note. I am glad that the information posted was of help. Thanks for taking the time to drop a note. Let me know how your trip went.